The old and absurd argument that "Portland doesn't have good barbecue" has been taken out back, put down, smoked for 12 hours, and served with some collard greens and cornbread. True, some of our places still can't seem to figure out how to slow grill brisket, but so many others have mastered the art of the smoker. 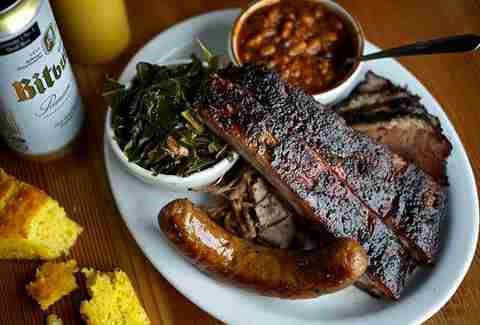 To wit, here are the 10 best spots to grab BBQ in Portland. There was speculation as to what would replace the short-lived Common Law in Pine Street Market... and then celebration as it was revealed: Kim Jong Smokehouse, the collaboration between Paadee/Langbaan’s Earl Ninsom, Smokehouse’s BJ Smith, and Kim Jong Grillin’s Han Hwang. And Hwang and Smith’s partnership make so much sense, as their two culinary worlds have considerable overlap. Sure, the bibimbap bowls are good enough on their own, but they’re even better with some short ribs or pulled pork added. The Pine Street location was popular enough that Smith converted his original establishment, Smokehouse 21, into a Kim Jong Smokehouse as well. Take a Southerner to Homegrown Smoker at either of its two food carts without telling them ahead of time what it is, and you might be met with something resembling violence: It’s barbecue, but it’s also 100% vegan. However, and stay with us here, get them to try it and you’ll likely convince even the most ardent carnivore to acknowledge how good vegan BBQ can be. Although wildly unconventional, it’s an essential element of the BBQ scene here. 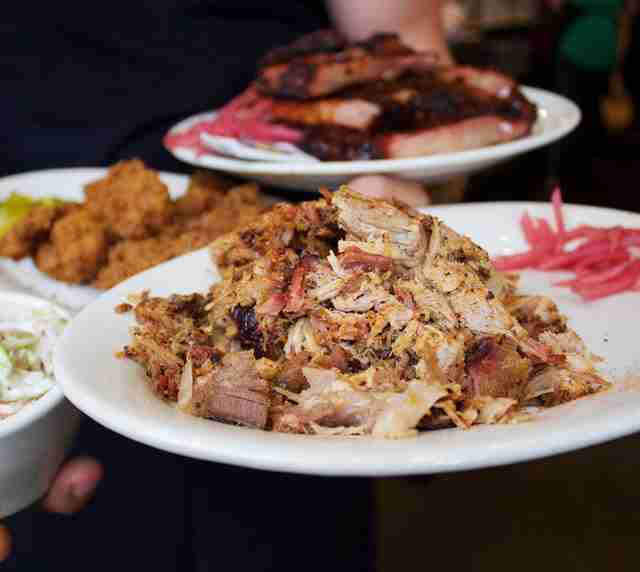 Sellwood is an area that’s often overlooked by younger folk, and that means they’re missing out when it comes to Reverend’s BBQ. The Carolina-style chopped pork shoulder is a star here, and the deviled eggs with burnt-end brisket might be the best in town. But it’s the griddled polenta with creamed corn and tasso ham that is truly revelatory; that alone is worth the visit to this part of town. It might seem odd to travel out to Newberg for good barbecue, but Storrs, named for co-owner Allen Routt’s mother, is worth the trek. And while the brisket and pulled pork are clearly Texas style, other things like the Oregon Pinot Noir BBQ sauce speak to the locality of Storrs. Splitting The Gran’ Daddy -- with all the meat options plus sides -- between two people is unquestionably the ideal way to end a day of wine tasting in the valley. Much like Storrs out in Newburg, you might not expect a drive to Lake Oswego to end in decent barbecue. 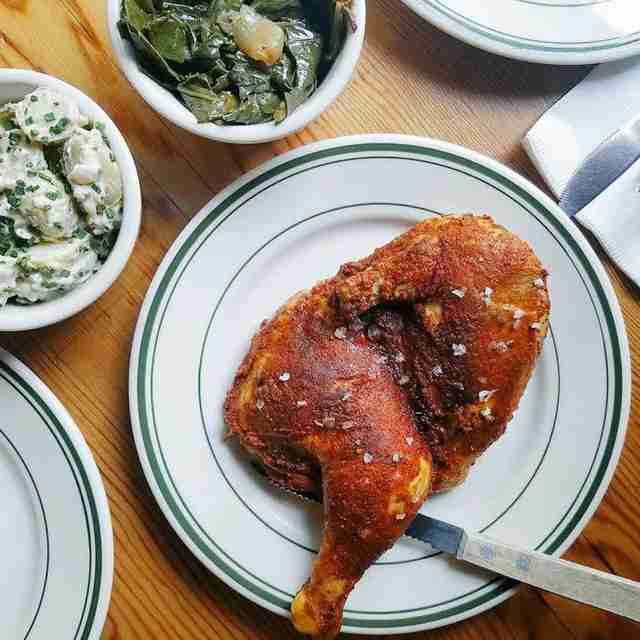 But this place manages to deliver some seriously good down-home cookin’, especially when it comes to sides, which is where Pine Shed does the most damage to your middle. The original spot, Smokehouse 21, is gone to make room for Kim Jong Smokehouse. But Chef BJ Smith’s Smokehouse now has a location across the river in Vancouver, and Smokehouse Tavern remains in SE. The ribs you’ll find here are tender and delicious, the burnt end brisket sells out regularly, and the collards are formidable -- likely the best in town. Add to that a cocktail menu created by Rum Club’s Mike Shea, and a weekend brunch full of smoked meats (Smokehouse Tavern only), and you’ll see why Smokehouse remains one of the city’s most popular BBQ destinations. 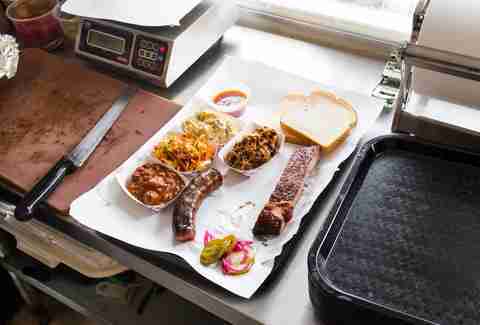 Sure, the platters at this food cart turned brick-and-mortar are fantastic ways to sample the menu, but don’t you want to try the best BBQ sandwiches in the city? The pork shoulder topped our list of best sandwiches in Portland, as befits the restaurant’s name, but there’s also the smoked fried chicken. Yes, it’s smoked, and fried. The lamb is the only thing that isn’t as memorable, but that doesn’t matter when everything else is as good as it is here. Why is it that the best BBQ always comes from food carts? The eponymous Matt continued that trend when he opened his truck in spring of 2015 after traveling the southern states, "researching" BBQ. Now, the cart puts out some of the best brisket and ribs in NE, and serves up unorthodox products, too, like brisket tacos. It’s the best of all worlds. Matt sells out of his meats most days, so get there early. This food cart in sleepy Foster-Powell is named for a bird most known as a cartoon character, and has a large painting of Chief Wiggum on the side of it, none of which bodes well. Good thing the brisket, which dominates the menu here, is as great as it is. Slow-roasted for 12-14 hours and chopped up for sandwiches and platters, it’s the best (only) brisket east of Cesar Chavez. The food cart pod is rare in that it has a covered area that also serves beer, so give a generous pour of that BBQ sauce over a brisket sandwich and grab an IPA. Rodney Muirhead gets up early every day to make sure his meat’s smoking at the right temperature, ensuring a consistent quality lacking in many other local barbecue establishments. 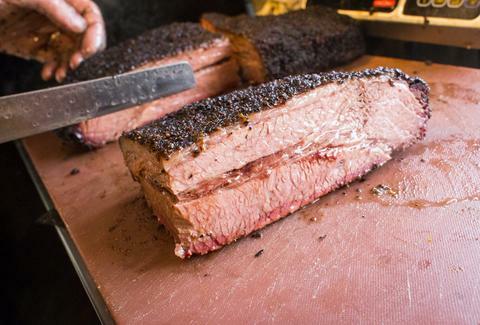 His ribs and brisket are so close to perfect it’s no surprise that it’s a town favorite. Unfortunately this means it comes with many of the downfalls of similarly adored local restaurants. If you can stand waiting and busy service, you won’t be disappointed by the food. It’s located in a Shell station and not even in Oregon. Yes, Daddy D’s may be in Vancouver, WA, but it’s worth crossing the river to our northern neighbor for the meat smoked by Daddy D himself. It’s probably due to being a Louisiana native that his BBQ shines.